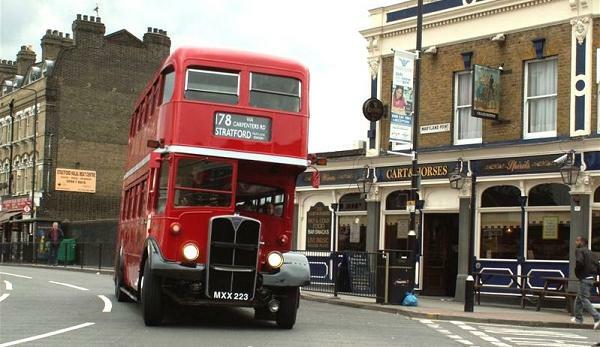 East-end route 236 was London's last crew-operated single-deck bus route, in April 1971. 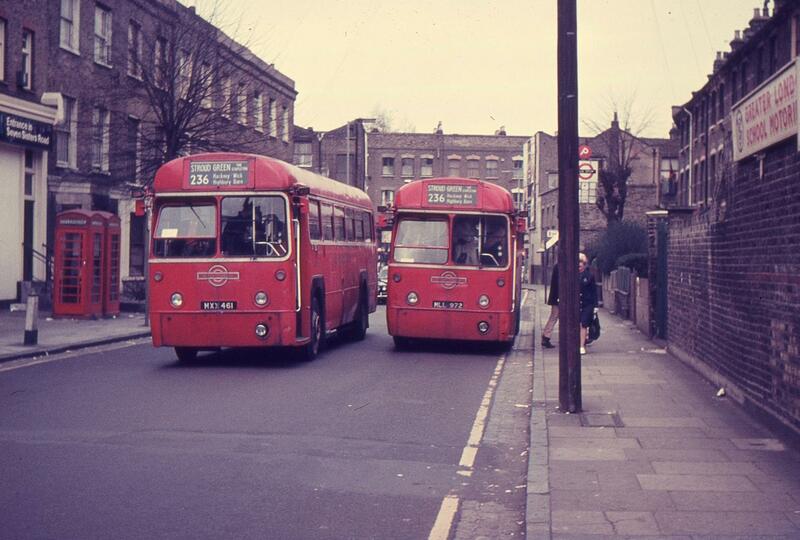 In another of Fred Ivey's shots, RFs 484 and 335 are in Rock Street, Finsbury Park, on the peak-hour extension to Stroud Green, just before the end. Fred will present another series of his pictures to LHRG in summer 2019. Click on (almost) any photo for a larger version, red text for links and the banner to return to this home page. 2019 marks 80 years since RT1 went into service and 40 years since the RT and RF classes finished service with LT. The first event to mark the RF anniversary will be a Kingston event organised by our friends at Amersham & District, on Sunday 24 March 2019. This will be followed on Saturday 30 March (the actual RF anniversary) by an RT and RF event at Barking Garage and River Road Garage, organised by London Bus Museum and thanks to Stagecoach London and Go Ahead London. This will include free RT operation on routes 62 (with thanks to TfL) and 23C plus many more delights. More nearer the time. The actual RT anniversary is Sunday 7 April, the day of the London Bus Museum Spring Gathering at Brooklands, which has an RT and RF theme. Any RT or RF family owner wishing to attend any of these events is invited to e-mail us. A further event will take place in August, details to follow. Meanwhile, reminders of the celebrations five years ago for RT75 are here and here, ten years ago here. The long-awaited article on Kingston termini is now up, featuring diagrams of the complex run-in and run-out at the garage, kindly provided by Ian Hogben. In addition, further research has added more detail on the special Kenwood Express service. The site provides details of single-deck services operated by the Central Area of London Transport, up to 1968, and in particular those operated by RFs (1952-1979) - see Red RF routes. We are pleased to include memories and comments from crews and others that remember RFs in operation. More detail is added periodically, and comments and additional input are welcome, please email. There are also a brief history of the RF class, some local history and some background notes on LT operations. This site is designed for Internet Explorer to be displayed at a screen resolution of 1024 x 768 (or higher). Currently there are a few issues with viewing in Safari that have stumped our extensive team of experts. Pages updated since January 2013 show the date of the last change. David Moore captured RLH23 at our first event, Hackney 2006, arriving at the Maryland terminus of the 178.